You are buying the Dechra EicosaDerm Omega 3 Liquid Fatty Acid For Cats And Dogs 32oz, model #32ECW. At ADW Diabetes, we offer a wide selection of Dechra products for cats and dogs. Shop with ADW Diabetes and save on all of you pet health care and grooming supplies. 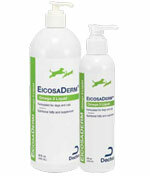 The Dechra EicosaDerm Omega 3 Liquid Fatty Acid For Cats And Dogs 32oz is a nutritional diet supplement and adjunctive therapy to promote healthy skin and reduce the effects of dry, pruritic skin.